Briton says: "I'm not really quite sure what his problem is"
Ok, we're going to wrap up our live text commentary now. Thank you as always for your company today and for your many contributions. We've maybe not witnessed a classic Chinese Grand Prix but there's plenty to rake over as the always fractious Hamilton-Rosberg relationship takes yet another twist. Keep an eye on the website throughout the day for more news and analysis of the Mercedes fallout. And don't forget the highlights show is on BBC One from 14:00 BST. We're back in just a few days' time with the fourth round of the season in Bahrain. Malcolm Shields: It's so pathetic this 'handbags saga' between Lewis and Rosberg. Put your toys back boys, shut up and race. Enough. Sam McAllister: Disappointed that Nico Rosberg has become so sour, finding excuses. It's sport. If you don't win, dust off and try harder. Reece Young: Shoe on the other foot Hamilton would have attacked and passed Rosberg - difference between a World Champion and a good driver. Jenson Button has been penalised five seconds, dropping him to 14th place, following his collision with Lotus driver Pastor Maldonado. The McLaren driver ran into the back of the Venezuelan as the pair scrapped for 13th place. Button also receives penalty points on his superlicence. You can watch footage of the incident here. Here's a picture of the marshals doing a Laurel & Hardy as they tried time and time again to push Verstappen's car through the pitwall, to ironic cheers from the Chinese crowd in the main start-finish stand. When is a crash not a crash? We've been keeping a keen eye out for the website to update from NO to YES, only to be found wanting. Alex Gillon has got in touch with a new definition. He says: "I define a 'crash' as contact that instantly ends a car's session. The Chinese Grand Prix was right on the limit, but since they were both able to drive away, I decided it was more of an 'assisted spin'." That clears that up... thanks Alex. That's not a crash... THAT'S a crash!Image caption: That's not a crash... THAT'S a crash! "It is the latest in a series of flash points that have tested the relationship between the two drivers, especially since the team became the sport's pace-setters at the start of last year." McLaren driver Jenson Button: "I can't say too much until I watch it on the footage. A lot of times it is very different in the car than on the screen. I have to watch it first. "It is better than what we expected our race pace to be around here but we are still right at the back." Lewis Hamilton's performance this weekend marks the seventh time in his career he has completed the hat-trick of pole, fastest lap and race win, putting him level alongside Alberto Ascari and his hero Ayrton Senna. Tracie Louise: Really tho... Is he that daft that he can't see that if he'd pushed harder he could challenge Lewis? Its always someone else's fault. Andrea Skyring: At the end of the day Lewis Hamilton drove to win the race. Saving tyres or fuel. As far as I can see, no compromise took place. Paul Alexander Grant: Nico has become a poor loser, many times last season we heard the team to Lewis to hold 2 second gap. Lewis ignored it & beat him. This subject has really got you guys going. Keep your comments coming in via #bbcf1. Anyone going to come down on Rosberg's side in this? Anyone? Here's some more from Nico Rosberg: "It was always very close with Sebastian Vettel coming out of the pits and that was completely unnecessary risk to put me in because we had a pace advantage over him. "But we were taking it so easy in that stage of the race that he (Vettel) was right behind me, putting me under pressure and went to try to get me in the pit stops. "It didn't compromise the team result but put unnecessary risk to the one-two and we went through that scenario before the race, which is frustrating. "We'll have a discussion and see how it goes. I'll let you know." The 'Has Pastor Maldonado crashed?' website has still not updated. Geoffrey Groom: Incredible drivers out there, it's not unreasonable to get frustrations emerging, that's the name of the perfection game! Nick Mallard: Oh Nico stop whining! You might actually get something done if you concentrated on racing for a change! Leigh Pavey: So funny, even Lewis Hamilton was laughing at him. This smacks of someone who doesn't know how to beat his team-mate. We've heard Lewis Hamilton's side of the argument, here's what Nico Rosberg's had to say: "He (Hamilton) compromised my race massively at the time because the best possible race for Lewis was to back me off into Vettel so that Vettel would try to undercut me with an early pit stop. "Then I would have to cover him and then I would have such a long stint at the end of the race that I would be without a chance. "That was very frustrating that Lewis was taking at easy as that on the tyres at the beginning of the stint. Interestingly, he said he was just thinking about himself and that says it all. "What upsets me is that my race was massively compromised and we went through that scenario before the race." Well the race is over but is the big story just beginning? There's some serious needle between Lewis Hamilton and Nico Rosberg after that race, with claim and counter-claim being kicked about between the two Mercedes drivers. Rosberg's claims of being backed up by Hamilton into the Ferrari of Sebastian Vettel during the middle stint of the race have been flatly rejected by the double world champion. Certainly the gap between the top four did come down dramatically in that middle stint, with Hamilton's advantage to fourth-placed Kimi Raikkonen down to 3.5secs at one stage, with Rosberg and Vettel pinched in between. Andrew Benson's race report here. The Pob: Situation with Merc drivers is down to the team having equal driver status. I would always have No1 & 2. No issues then. Lewis Hamilton responds to claims by Nico Rosberg that he was 'backing up' his team-mate during the race: "It is absolutely not the case. I wasn't really looking in my mirrors and I wasn't trying to back Nico up to Sebastian. "If he wanted to get close and overtake he could have done. He was always about four or five seconds behind. "He never got close so I don't know what his problem is. I did what they asked me to do. There shouldn't be too much aggro." Some tense words between Lewis Hamilton and Nico Rosberg in FIA press conference about the "backing up" incident in second stint. Today's result means Lewis Hamilton has now finished on the podium for the 10th consecutive race - the longest run of his career. His previous best run of nine straight came in the first nine races of his career, at McLaren in 2007. The Briton has also now passed fellow British world champions Jackie Stewart (1,921) and Jim Clark (1,942) on the all-time laps led list. Today's result marks the seventh time an F1 race has finished under a safety car. The first occasion was at the 1999 Canadian Grand Prix (below). A lengthy gap followed before the second at Australia 2009, since when we've seen them at Italy 2009, Monaco 2010, Brazil 2012 and Canada 2014. James Weir: Worth mentioning Lewis Hamilton took the trifecta in China. Pole, fastest lap and Win. Not a bad effort at all. Sebastian Vettel: "It was a good race. All-in-all we were a bit close on softer tyres to Mercedes. On the harder tyres they were just that bit too quick. "I'm very happy. It's been three out of three podiums so it's been good. I feel really happy in the team and, hopefully, we'll get a bit closer to challenging Mercedes." Lewis Hamilton: "First of all a fantastic job by team. It was great to have a smooth weekend. "It was about controlling the gap for me and saving tyres for when I needed them. "The safety car wasn't helpful as it was an anti-climax but as long as no-one was hurt then that's the important thing." Nico Rosberg: "I gave it everything to close the gap but it didn't pay off because my tyres died off. "We're happy with the gap to Ferrari. We have beaten them here after they won in Malaysia and it was a good important comeback." Double Olympic 400m hurdles champion Ed Moses is doing the podium interviews today. It's my turn next week, then Judith Chalmers. All very cordial between the top three as they wait to go on to the podium. Handshakes all round between Hamilton, Rosberg and Vettel, who is heard talking about an "anti-climax". Mercedes engineer: "Great stuff Lewis, stellar weekend." Lewis Hamilton: "Whoop, yeah man." So, Lewis Hamilton wins ahead of team-mate Nico Rosberg with the Ferrari of Sebastian Vettel in third. The second Ferrari of Kimi Raikkonen comes home in fourth ahead of Williams pair Felipe Massa and Valtteri Bottas. The Lotus of Romain Grosjean is seventh, ahead of Sauber's Felipe Nasr, the Red Bull of Daniel Ricciardo and the second Sauber of Marcus Ericsson. That's a fourth Shanghai win for Lewis Hamilton - the 35th of his career overall - and extends his lead at the top of the world championship. LEWIS HAMILTON WINS THE CHINESE GRAND PRIX. "Max Verstappen's rear axle has locked so probably a gearbox issue. A disappointment but another strong performance from Max." Lewis Hamilton: "So we're going to finish behind the safety car are we?" Race is ending amid high farce. They cannot get that Toro Rosso shifted from the grid. The field, led by Hamilton, files slowly past the stricken car of Verstappen and on to the last lap. James Stevenson: Aww! Max Verstappen would have been my driver of the day. He'd got into the probably the best position possible today. Great drive. OK, the Ferrari guys are back in the garage. Just precautionary? Or mind games? Anyway, neither Vettel nor Raikkonen will be coming in. Two laps remaining under the safety car. Surely this is over. Max Vertappen is out in the Toro Rosso from eight position. His second retirement from the points in three races. The engine has let go amid an awful grinding cacophony, locking the rear wheels and forcing him to stop on the pit straight. He's given us a lot of entertainment today but it's all been too much for his poor car. The Lotus is out, wheeled back into the garage after a hairy afternoon. Race control confirms that clash between Button and Maldonadio will be investigated after the race. Just as I was singing the praises of Maldonado and Button for a good clean fight, they come together at the end of the pit straight. And guess what? It was not Maldonado's fault. Defending his position, as he had every right to do, the Lotus man was hit up the backside as Button missed his braking into turn one. Both cars continued but there's damage to both. "That was brilliant and brave from Button in his duel with Maldonado because Maldonado has shown he is fast but wild this afternoon. The racing skills of Jenson Button are fantastic." After a - shall we say - trying afternoon, Pastor Maldonado shows what he's capable of in a fantastic, clean duel with the McLaren of Jenson Button. The pair duked it out side by side through several corners before the Venezuelan moved ahead. Button came back to retake the place at the hairpin, while Fernando Alonso is now joining the party. On lap 46 of 56, the order is Lewis Hamilton leading Nico Rosberg 4.5secs with both drivers running to the finish. The Ferrari of Sebastian Vettel is 16.1 secs off the lead, with his team-mate Kimi Raikkonen 18.8secs of the pace. Felipe Massa is 46secs back in fifth ahead ahead of Williams team-mate Valtteri Bottas. Kimi Raikkonen: "C'mon, get that McLaren out of the way." The Finn sounds frustrated as he makes his way through the backmarkers. I think he knows the podium is gone barring any retirements ahead. Red Bull driver Daniil Kvyat on his retirement: "It has been a tricky weekend and not a happy end to it. "It was messy at the start. I didn't have the best tyres and the other cars were faster than me. We will overcome these difficult moments." Toro Rosso rookie Verstappen dives past Force India's Perez at turn six to claim eighth position. The Sauber of Nasr also takes Perez a the hairpin one lap later to drop the Mexican back to 10th. Maldonado has had a proper spin this time. The Venezuelan pirouettes in a cloud of tyre smoke but keeps the Lotus going. Lewis Hamilton: "Seat's getting hot again." Hamilton has had issues with an over-heating seat all weekend, caused by its proximity to the car's energy recovery system. Raikkonen has become the last of the top four to make his stop. Hamilton leads by 5.4secs from Rosberg with Vettel third, 5.6secs back. Raikkonen is fourth, another three seconds back. Massa, Bottas, Grosjean, Perez, Verstappen and Nasr complete your top 10. "With higher fuel loads it seems Ferrari have been able to keep Mercedes honest but when it lightens they can't keep up." Lotus driver Maldonado just had a moment on his way into the pits, missing his braking and running up an escape road. After a few flustered seconds, with marshals moving in, he finally selects reverse and boils off up the road and into the pits. The website asks, 'has Pastor crashed'? He upped his pace when he had to at the end of his second stint and comes in at the end of lap 33 to put on new boots. A 2.5sec stop is completed and he's out again, some six seconds ahead of Rosberg. The McLarens are still running after half distance, which is something of an achievement. Button (pictured) is 15th, with Alonso in 13th. Kimi Raikkonen's engineer: "The plan is to go longer on this tyre and have a shorter stint at the end." Rosberg has been losing time in the past few laps to Hamilton and pits four seconds behind Hamilton. He's out on the medium and will hope for an undercut, but has the damage been done? Rosberg comes out around two seconds ahead of Vettel. Peter Wanyonyi: Lewis Hamilton managing his own tyres while simultaneously destroying Nico and Vettel's. Genius. Rob: Hamilton playing games, has plenty of lap time in hand, same from first stint can pull a 4 sec gap before first pit stop when needed. Clare_Star: Ha ha ha! "Lewis if you don't play nicely Papa Toto will turn off your engine and send you to bed" #bbcf1 radio message of the day so far. As earlier, Vettel is the first of the leading cars to come in, at the end of lap 30. He's on the medium tyre and needs to push now because these stops could be crucial to who wins this race. Nico Rosberg: "My front left is becoming a problem." "Lewis Hamilton has been told to increase his speed - he's been put on the naughty step. They have said if he doesn't they will pit Nico Rosberg first." After several laps of trying, Ricciardo is past Ericsson and into 11th. Ferrari engineer: "Can you go faster than this, Seb? Vettel: "Not much, I am on the limit." Force India driver Nico Hulkenberg on his retirement: "I'm not sure what happened to the car. I just lost drive and had to park the car. It was an unpleasant experience. "It is what it is. I felt OK, not mega not great. I was surprised I could keep up with the Toro Rosso and Lotus at the start. It's disappointing." Hulkenberg is one of two retirements so far, Daniil Kvyat of Red Bull the other. The Red Bull of Ricciardo and the Sauber of Ericsson remain locked in a good scrap for 11th place. They've come close a few times but the Swede is just about hanging on - for now. Who would have thought at the end of last season that Red Bull would find themselves duelling with Sauber in 2015 - a team that scored no points last year don't forget. We just saw a very slow moving Toro Rosso piloted by Carlos Sainz. The rookie looked to be on his way back to the pits to retire, but a few button presses on the steering wheel seems to reset the system and he's back up to pace again. Fernando Alonso's race engineer: "Fernando, we're not sure the fuel dash is working properly." "I think Lewis Hamilton is in control here. He is managing the situation but he is certainly not driving into the distance like he did 12 months ago." To Rosberg: "Left front most worn, rears in good condition." Stewart: Don't blame Renault. Blame Red Bull wanting the engine at unworkable angles. "It was beautiful. He is using his DRS and calmly adjusting his steering wheel. This young man certainly has race craft." Have we got a race shaping up for you. On lap 23 of 56, the gap from Hamilton in fourth to Raikkonen in fourth is 3.8secs. With Rosberg and Vettel in between, this is now getting very tight. Ricciardo's Red Bull is the latest to attempt to pass a Sauber at the end of the long back straight. He's gets it wrong though, runs off and Ericsson survives. Ricciardo gathers it up and continues in 12th. "Lewis, if you'd like to pick up your pace a little bit." Nico Rosberg: "Lewis is driving very slowly, so tell him to speed up. If I go closer I destroy my tyres like in the first stint." Verstappen's Toro Rosso has just done a carbon-copy pass on Ericsson's Sauber team-mate Nasr. He again does the business at the end of the long back straight, out-braking the C34 into the hairpin. Nico Rosberg: "Reduce the conversation ... I know what I have to do." The McLarens are still squabbling down the order, albeit on different strategies. Button has just passed Alonso for 15th place, although the Briton is on the quicker soft tyre with Alonso racing on the medium. "Daniil Kvyat's retirement was an unusual one as he drove the car over to the fire warden's post. To add insult to injury, it's on the outside of the track and is a long walk home." And Raikkonen (in the number 7 Ferrari) got past both Williams on Lap 1 to jump from sixth to fourth. Hamilton had a great start after positioning his car diagonally in his grid box. Kvyat's Renault engine in the back of the Red Bull has gone bang in a big way. Smoke and flames lick the back of the RB11, which are quickly doused by fire extinguisher foam. Game over and the end of a bad weekend for the Russian. It's also another blow to the already strained relationship between Red Bull and Renault. Rosberg and Raikkonen take their stops and return to the track in their earlier positions. On lap 16 Hamilton leads once more. The gap is now 3.6secs. Vettel looks closer to Rosberg, while Raikkonen is fourth. OK, our leader is in. A 2.8sec stop for the Mercedes man and he emerges well ahead of Vettel's Ferrari. F1 on Twitter have also posted a picture of Kvyat resisting Ricciardo earlier. So close. 2.3sec stop for Vettel. He's doing another stint on the soft tyre. Out third-place man is coming in. Nasr and Maldonado have been the first drivers into the pits. Maldonado's Lotus team-mate Grosjean is also in and out on the mediums. Verstappen also in. Daniel Ricciardo: "I'd say we get off this tyre as soon as we can - it's not getting any better." 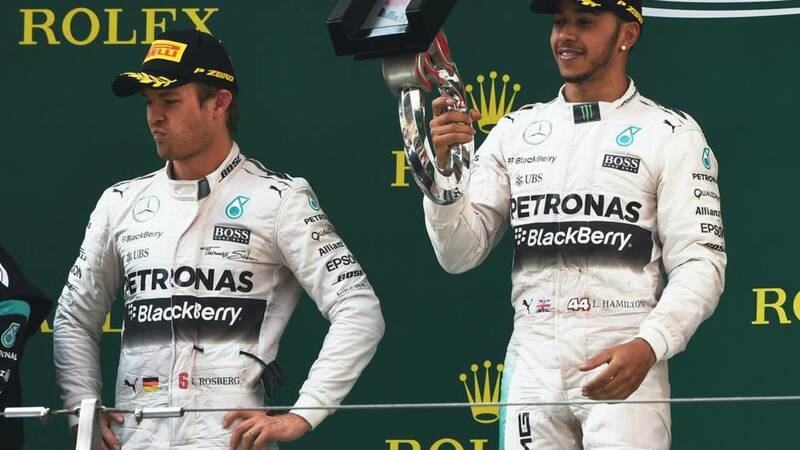 "Nico Rosberg is keeping a second behind leader Lewis Hamilton. We are coming up to an interesting team decision as normally the lead driver gets decision to choose when to pit. Hamilton needs to try to open that gap out." The Ferraris are also keeping the Mercedes drivers very honest. This could get interesting. So Force India's Nico Hulkeberg is our first retirement on lap 10. Not a great season for the Silverstone team so far. Their late start to pre-season testing is starting to bite. Nico Hulkenberg: "I lost the gearbox - something bad happened. Something went really wrong there, a big bang." Great pass from young Max Verstappen there, the Toro Rosso man out-dragging the Sauber of Marcus Ericsson on the 1.1km back straight and getting the pass done under braking. Into the points goes the Dutchman. Fqiren: Red Bull & McLaren fighting tooth & nail for 14th. How times have changed. "He (Daniil Kvyat) is going to get his first talking-to from Red Bull chief Christian Horner after the race. Kvyat and team-mate Daniel Ricciardo are on different strategies and there is no point in him keeping Ricciardo behind him." It's as you were at the front with Hamilton's Mercedes ahead of team-mate Rosberg by around a second. Vettel is third in the first of the Ferraris, three seconds further, back, with Raikkonen fourth ahead of Williams duo Massa and Bottas. Next up is Grosjean, Nasr, Maldonado and Ericsson in alternating Lotuses and Saubers. "Daniel Ricciardo's car went into anti-stall mode at the start." That explains that one then. We've just heard the Red Bull team radio telling Daniil Kvyat to get out of the way of Ricciardo as they are on different strategies. The message appeared to be slow in getting through as the Russian chopped rudely across the Australian at the start of lap six. Luckily contact was avoided and Ricciardo got the job done later in the lap. Red Bull's Daniel Ricciardo overtakes McLaren's Fernando Alonso and Coulthard says: "That is brave, incredible - round the outside at six and seven." We saw Daniel Ricciardo looking wild-eyed earlier and he'll be even more so now after a poor start in the Red Bull. Lining up seventh, the Australian dropped to down to 16th place off the start. He's on the move though and has put a great move on Fernando Alonso's McLaren. "When not to put the kettle on? Not from lap 10 onwards as that is when the first round of pit stops are set to start. It is absolute pandemonium in the pits this afternoon." Jeremiah Kariuki: Good start by Bottas. However quick recovery from Kim and good moves up the grid! "Lewis Hamilton's starting grid position sent a clear message to Nico Rosberg, saying I am coming straight over. I've never seen such a position." Carlos Sainz has had a spin in the Toro Rosso at the start of lap two. The Spaniard seem just just run wide and slowly rotated. "Don't talk to me in the corners please," comes the message to his team on the radio seconds later. Hamilton is 1.1secs clear of Rosberg after lap one. Vettel is third ahead of Raikkonen, with the Willliams of Massa fifth ahead of his team-mate Bottas. Hamilton holds his lead from Rosberg through the first few turns. Vettel runs third while Raikkonen, from sixth on the grid, is up to fourth. Aggressive grid positioning from Hamilton. He's going to cut across his team-mate here. The cars are all away on the formation lap. Top 10 are all on soft tyres. "What Ferrari had in their favour in Malaysia was their use of tyres. Can they replicate that? "Tyre choice is going to be key today. It is hot for China and it is going to be interesting." Paul Marsh: Looking for another good drive from Raikkonen today! He was brilliant last time out but was overlooked by Seb's win. Go Kimi!! Rob: Hamilton to win, Vettel second and Rosberg in third. Chris Smith: Looking forward to this, all mixed up and no certainties. Fingers crossed that #JB22 can grab a top ten. The Daily Telegraph's coverage of qualifying centres on the possibility of a rift developing between Mercedes and their driver Nico Rosberg, who was not haapy with the "pressure" he was put on by the team during qualifying. Niki Lauda, Mercedes non-executive chairman: "It's going to be big fight between Lewis, Nico and Sebastian. "We try to learn out of every mistake and I think we are well prepared but it is not going to be easy." BBC weather forecaster Ian Fergusson Twitter: 10 mins to race start: air temp 20.7C; track 47C. Light breeze from ENE. Dry conditions throughout the race. Two stops on the cards? "Strategy-wise, this is an unusually open race. Two stops is the most likely, but the time difference between two stints on the 'softs' and one on the 'medium' and vice versa is small - some teams say as little as 2.5 seconds over a race distance. Ferrari saved a set of 'option' tyres through qualifying and also have much lower tyre degradation than everyone else, so are considered likely to do two stints on the soft. "Mercedes also have extra softs and probably don't need to shadow them - and doing so could be a mistake - but might be tempted after their defeat in Malaysia, despite Nico Rosberg's observation that the soft 'is going to fall apart at some point, quite dramatically'. But doing two stints on the soft depends on how long you can make them last. "If each set will do only 14-15 laps, that's not enough. First stops could be as early as lap 11 but are more likely around lap 15. And the hotter conditions of race day throw in another curve ball - no-one knows how that will affect degradation. It is a race to be managed on the fly." Lotus on Twitter: Grid presentation about to start. Helpfully, they have chosen to perform right by our pitwall. So kind! You might struggle to find any F1 coverage in the national press this morning but we've picked you out a few snippets. The Sunday Mirror focuses on world champion Lewis Hamilton having to deal with a hot seat on Saturday. "There promises to be a very close fight for the minor points positions between four teams that, as Toro Rosso's Carlos Sainz Jr puts it, 'are within half a second - Red Bull, Lotus, Sauber and ourselves'. Red Bull teams of one kind or another book-end that group, with Daniel Ricciardo in seventh and his team-mate Daniil Kvyat in 12th, just ahead of the Toro Rossos, led by Max Verstappen, and the Lotuses and Saubers in between. "Both Verstappen and and Sainz felt they could have done better, while Kvyat says he was hampered by recurring power-unit problems that meant that when he did get his one decent lap he had 'no rhythm'. Ricciardo, meanwhile, actually has hopes of challenging the Williams cars for fifth place, saying he believes the Red Bull is much more competitive on race pace." Watch the Briton's latest Shanghai pole here. "It says something for how far McLaren have come since the start of the season - and also for how far they still have to go - that Jenson Button was disappointed to miss out on getting through into second qualifying by just over 0.2secs. Only a month ago in Melbourne, after all, the McLarens were 1.5secs off the next slowest car. And the gap to the pace-setter in Q1 - Ferrari's Sebastian Vettel - was down to 1.7secs, when it had been more like four or five seconds to the Mercedes in Australia. "Button also beat team-mate Fernando Alonso for the second race in a row - albeit by only 0.004secs after the Spaniard had missed all of final practice. Alonso did not seek to use that as an excuse, saying he was happy with his lap. For the Spaniard, who was substantially faster than Button in the race last time out, the priority for the race in China is to finish with both cars, to accelerate the much-needed learning process." Toro Rosso on Twitter: Drivers ready, in their cars. We'll be off to grid soon. Yes it's time, THAT time! Lewis Hamilton and Sebastian Vettel have just had a little moment at the pit lane exit. Hamilton appeared to be attempting to pass a number of cars queuing to do practice starts when the Ferrari of Vettel pulled away just in front of him. Hamilton waved his hand at the German and quickly got on the team radio, saying: "Ferrari's just so dangerous. "As I was pulling away, I almost crashed into him." That should spice things up. Four times a previous pole-sitter and a three-time winner, it's no surprise to see Lewis Hamilton leading the way in laps led at the Shanghai International Circuit since the race was first held in 2004. It's time to say a quick happy birthday to former Brabham, Ferrari, Lotus and Williams driver Carlos Reutemann, who turns 73 today. The Argentine won 12 grands prix and scored 45 podiums in a 146-race career between 1972 and 1982. Despite being a front-runner for several years, the world title proved madly elusive for Reutemann (below). The closest he came was in 1981, when he lost out by just one point to Nelson Piquet after the final round at Caesars Palace. Also celebrating today is Italy's Corrado Fabi, who turns 54. The younger brother of fellow F1 racer Teo Fabi, Corrado raced in 12 grands prix for Osella and Brabham between 1983 and 1984. "For Nasr, it was confirmation of his stellar performance on his debut in Australia, after a difficult weekend in Malaysia when fate seemed to conspire against him. And it could have been even better - he said he lost a front wing flap at the start of his final run, which cost him a couple of tenths of a second, which might have moved him ahead of Lotus's Romain Grosjean for eighth. Sauber's big step forward this year is clearly mostly to do with a corresponding advance by Ferrari on their engine - Nasr admitted the cash-strapped team were still lacking significant amounts of downforce." Red Bull Racing on Twitter: From revolution to the evolution. Alonso's perfect record in jeopardy? If Fernando Alonso wants to maintain the above record, he'll need a significant change in fortunes at McLaren. He's yet to see the chequered flag in 2015 having missed the first race with concussion and then retiring in Malaysia a fortnight ago. An engine failure in FP3 yesterday was also a reminder of the McLaren-Honda's fragility. Read more Chinese Grand Prix facts and stats here. "Manor's Will Stevens was buoyant after qualifying and is very much looking forward to his first race for the team in Formula 1 - which is only his second grand prix after his one-off for now-defunct Caterham in Abu Dhabi at the end of last year. "Various problems, all rooted in the team's 11th-hour rescue by its new owner Stephen Fitzpatrick of Ovo energy, have meant Stevens has had a troubled time so far this season. But he described Saturday as 'a good day', adding that he had even managed to get a run on high fuel in morning practice. Those were his first laps in race trim ever in the car, so the race will be a journey of discovery." reflected on some of the most memorable moments from previous Chinese Grands Prix. The event was first held at the Shanghai International Circuit in 2004 and was won by Ferrari's Rubens Barrichello. The race had six different winners in its first six races, including Michael Schumacher, Fernando Alonso, Kimi Raikkonen and Jenson Button. Lewis Hamilton, victorious in 2008, became the circuit's first repeat winner in 2011. He added a third win last season and is gunning for number four today. Red Bull Racing on Twitter: Need a Shanghai track guide? In the paddock, it's right at your feet. "Williams have had a bit of a reality check so far this season. Having expected after pre-season testing to be neck-and-neck with Ferrari, to be some way off their pace has been an unpleasant surprise. But things are much more to their liking in China, with both Felipe Massa and Valtteri Bottas managing to split Sebastian Vettel from Kimi Raikkonen, and aiming to at least replicate that in the race. "Massa's lap, in particular, won praise from technical boss Pat Symonds, who said: 'Felipe was really on fire in qualifying. It was a great lap.' Massa himself described it as 'amazing'. But Symonds admitted that keeping Raikkonen behind in the race will not be easy - Ferrari, he said, were fundamentally quicker still." As always we want your involvement this morning. Is Lewis Hamilton going to run and hide today or can team-mate Nico Rosberg keep him honest? And what of Ferrari? Can their better tyre management really close a gap of almost a second in qualifying? Get in touch on these or any other F1 subjects on (#bbcf1) via or by visiting our page. McLaren driver Jenson Button: "I don't know how its going to go. We expected more from qualifying. "We didn't have the pace. I don't know why but we will have a look at it. There is improvement needed but we're looking forward to what we have today." Ferrari driver Sebastian Vettel: "It's great to see there is so much support here. It seems to be growing every year." Asked if his win in Malaysia would have given Mercedes a wake-up call, he says: "I hope they didn't wake up. "It will be tough. We have to be realistic. We will try to be a bit closer to them again." Mercedes driver Nico Rosberg: "I'm feeling good. Yesterday was frustrating but there is going to be a lot of opportunity today. "There is going to be a lot going on with tyre degradation and fuel strategy. It will be quite difficult to work out what is going on at home but in the car as well. There are so many different scenarios but we hope to be a bit quicker than Ferrari today. "I have to try to get some points back on Lewis and Sebastian as well. It's an important day." Mercedes driver Lewis Hamilton: "I feel pretty good. I have got amazing support here. "You have to be a real attacker here. Here, you just have to look after your tyres and we have to try to do a better race than Ferrari." Can tyre management close gap at front? "The race is expected to be a two-stop strategy and as long as Mercedes can do two stints on the soft tyres, as Ferrari can, it is hard to see on the face of it how Vettel can challenge Hamilton, given the significant pace advantage the world champion has had all weekend. Hamilton was 0.9secs clear in qualifying, 0.4secs in most practices, and 0.7secs on average ahead on the average of his race-simulation run in Friday practice. Realistically, Ferrari admit that their hope is to split the Mercedes, but know that even that is a stretch." In addition to this humble text service, the BBC also has live commentary of the race over on Radio 5 live from 06:30 BST. Race highlights are on BBC One from 14:00 BST. "Lewis Hamilton has looked pretty imperious all weekend, and although he qualified only fractionally ahead of team-mate Nico Rosberg, the actual margin between the two's consistent pace is probably bigger. "Hamilton was a quarter of a second up after their first runs and has been consistently quicker all weekend. But the world champion's final lap was not clean and that allowed Rosberg to close in. 'I had more time to come in that lap which I just didn't pull out otherwise the gap would have been the same, I think,' said Hamilton, blaming not getting the most out of his tyre. The Ferrari threat is certainly 'real', as Mercedes F1 boss Toto Wolff puts it, but Hamilton remains a strong favourite for the race victory." "Two races down, a win apiece for Formula 1's two top teams, the Mercedes drivers separated by 0.04 seconds in qualifying and Malaysia winner Sebastian Vettel of Ferrari lining up right behind them. "The Chinese Grand Prix promises a great deal." Ferrari showed in Malaysia last time out that they can be more than a match for Mercedes if conditions are in their favour, and both teams have been talking up the potential of the scarlet cars in race trim. It may yet turn out to be a closer contest than practice and qualifying suggests. Smarting from a failed Grand National flutter? Bet against Jordan Spieth at Augusta? Ticked Cambridge on the Boat Race betting slip when you meant to put Oxford? Well, your day might be about to get better if you bet the farm on Lewis Hamilton to win in China this weekend. The Mercedes man starts from his fifth pole in Shanghai - 41st overall - after seeing off team-mate Nico Rosberg by just 0.042secs in qualifying. The qualifying gap between the bickering Silver Arrows and the chasing pack led Ferrari's Sebastian Vettel was almost a second, so it could be a straight fight between Hamilton and Rosberg today. Yes it's early, but it's time to rise and shine and watch some motor racing. To ease you into Sunday, here's a rather lovely picture of the Shanghai International Circuit paddock from yesterday evening, courtesy of the guys at Lotus. Now get kettle on and settle down. Lights out at 07:00 BST.